A random collection of retro oddities and mega curiosities. 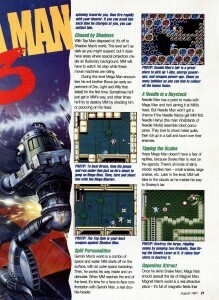 As shown in this week’s prior posts, gaming magazines will occasionally get their facts a little mixed up. Sometimes it’s a product of working from pre-finalized versions of a game. Other times, I’d have to say the reviewer got a little confused, ran short on time, or simply didn’t care. For the final day of retromags week, I’ve collected a bit of all of the above. Enjoy! 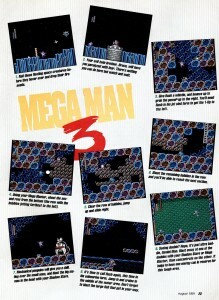 Lets kick things off with some Mega Man 3 coverage from Gamepro! 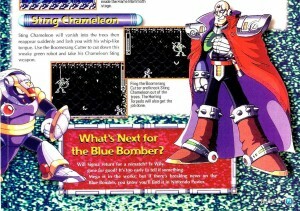 The article calls the giant peace-keeping robot “8” instead of Gamma. Did they confuse a lower case Gamma for a poorly printed 8, or did this have something to do with the reviewer being “Tobar the 8 Man”? Mega Man has an evil brother named Bruce. (That sounds familiar somehow…) Bruce is a failed experiment who has a few screws loose, explaining his unpredictable behavior. 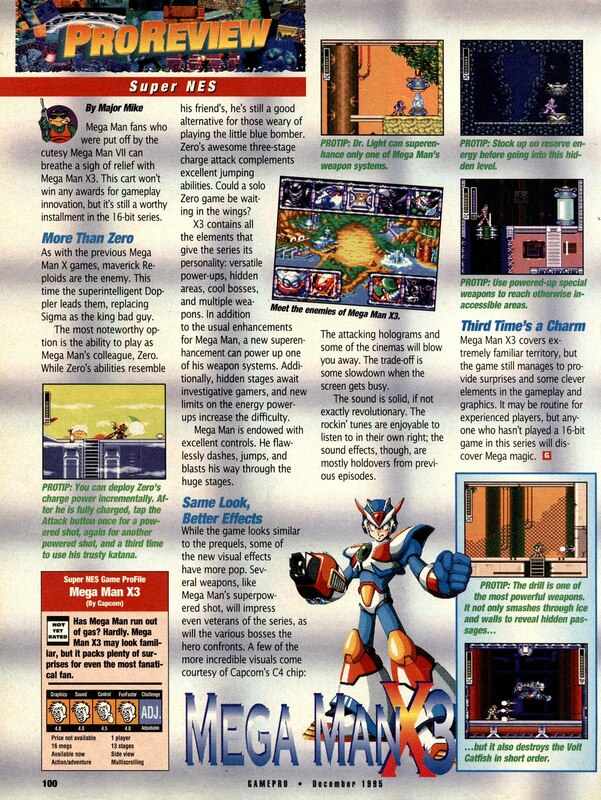 This is clearly just a mistrans of Blues, perhaps Capcom USA had yet to redub this character as Protoman when this article was first written (this was a “Greatest Hits” reprinting). 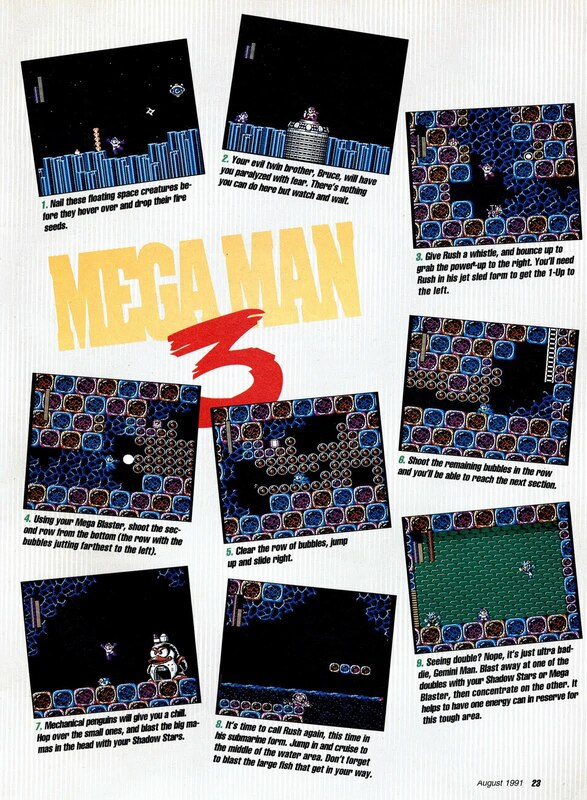 Bruce’s behavior in Geminiman’s stage is viewed as paralyzing Mega Man with fear, rather than helping him. Great big art of the MM3 cover! It got a little cropped, but the level of detail is nice. It might not be the best cover art ever, but compared to Mega Man 1 and 2’s US boxes, it felt like a leap in the right direction for me. Mega Man’s weapon is the “Mega Blaster.” That’s reasonably close to Rock Buster. 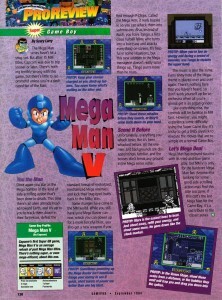 This 4 page spread made Nintendo Power’s 20 page one all the more impressive by comparison. Next up, Gamepro #66 pro-reviews X2! From January 1995, this might be the earliest review I’ve ever come across to call Zero Mega Man’s robotic dog (but it definitely wouldn’t be the last)! It became quite a trend later on. I guess it’s partly because Zero is such a cool name for a dog. X3 comes next, and Zero’s gone from canine to colleague status. They even predict a future series starring Zero to be in the works… But that’s not the most interesting part. Check out the top right screen shot! It’s a Vile stage teleporter, hidden underwater. That definitely didn’t make the final cut. 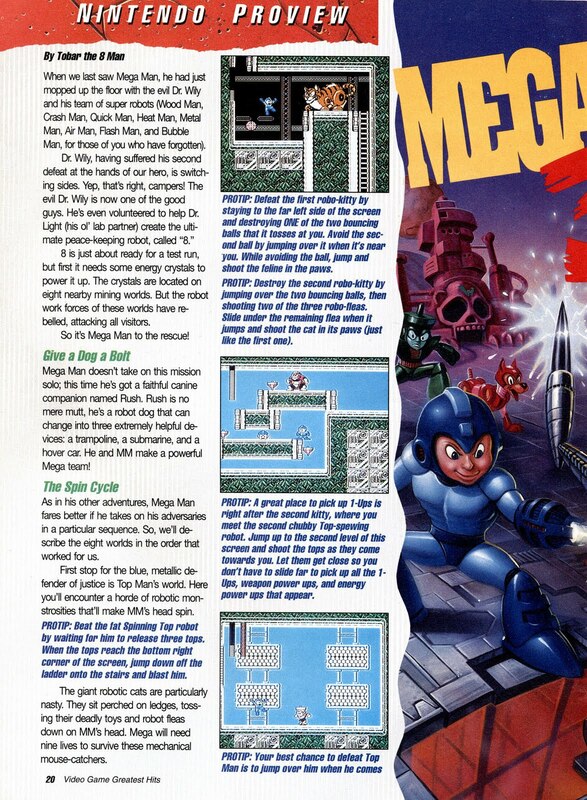 And now we turn to Gamepro‘s Scary Larry for a less-than-impressed review of Mega Man 5 for Game Boy. For their 5th gameboy Mega Man title, Capcom broke out 8 all new bosses, a new helper, and a new default weapon, long story cinematics, all along with full Super Game Boy compatibility. Larry just saw more of the same. I’d be surprised if he played past the first few levels, since he thinks Rush is absent from the game, and that you have to buy the Mega Arm. Plus, no comments about how “it’s really Dr. Wily again!” (Oops, sorry if I spoiled anyone). 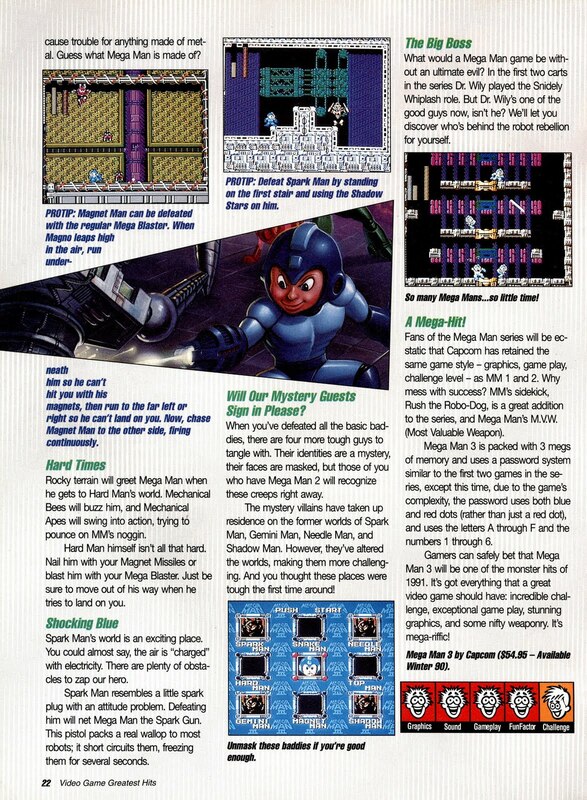 Oh, and that picture of Mega Man having some Duke Nukem style ‘roid rage is from the cover art for Mega Man the Wily Wars, the compilation game for Genesis that wound up being a Sega Channel exclusive in the US. Last but not least… nope, not another Gamepro. 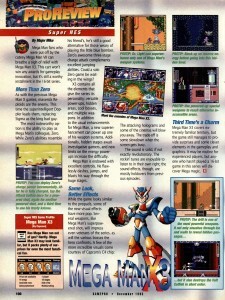 Let’s take a look at Nintendo Power #97‘s Mega Man retrospective extravaganza! Yes, Gutsman can be a very difficult boss to tackle for beginners. Especially if they don’t realize that they’re actually fighting Elecman. Things are still looking pretty good, a few more small details like “Euker” instead of Enker and “Quintet” instead of Quint, but on the other hand they even got Giant Suzy’s name right. Nice job guys! 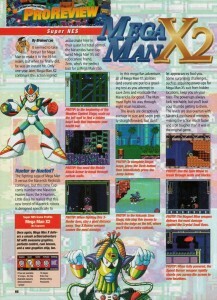 The whole pretext for the article was that Mega Man X was being re-released. But it’s such a classic that I’m sure everyone already knew that you don’t get any weapon from beating Storm Eagle, and that Vile is more commonly known as P. Ninja. 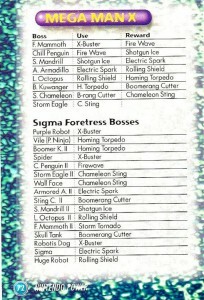 And of course, who could forget Sigma’s pet Robotis Dog, the robot who is a dog. Oh wait, wasn’t the dog’s name Zero? Eh, who can keep all those silly Mega Man names straight, anyway? This one is included because it always makes me smile. 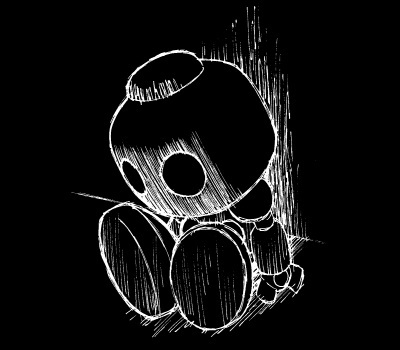 What’s next for Mega Man? Playstation and Saturn, and you won’t find it in Nintendo Power. 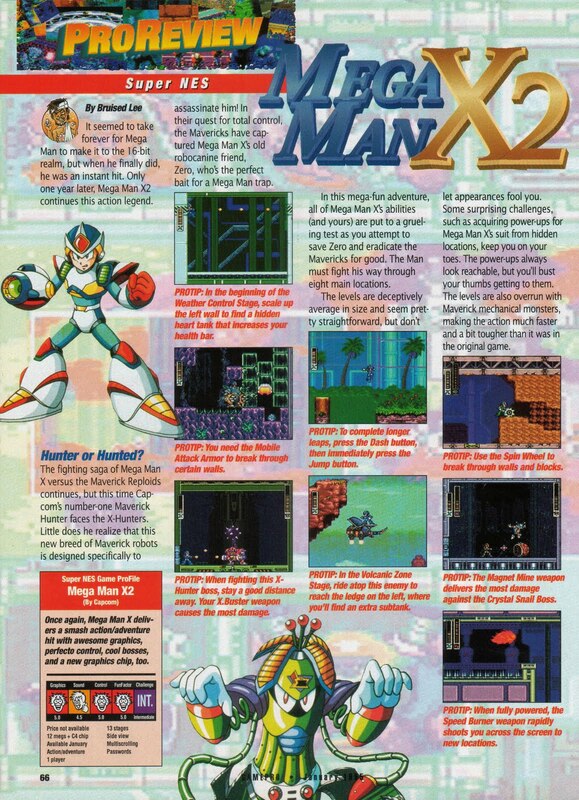 As a matter of fact, Mega Man 8 was already out by the time this article was published, and news of X4 was already coming down the pipeline in other circulations. 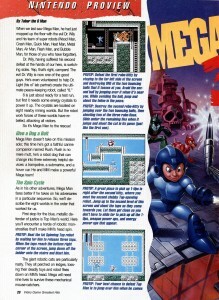 For the longest time, Nintendo Power had a funny way of completely ignoring the existence of any Mega Man game that wasn’t on a Nintendo platform, as if it had never existed at all. I believe they even tried to say Mega Man 64 was a new game instead of a port, although I don’t have the picture proof to back up that memory (sadly, that’s outside Retromags‘ current project scope). That kind of willful denial is actually sort of sweet, as if Mega Man’s temporary departure from Nintendo was too heartbreaking for them to handle, and lying to themselves being all they could do to keep their minds from snapping entirely! Well, maybe not. Did you guys enjoy Retromags week? I must say, I’m looking forward to returning to the regular schedule. It is surprisingly hard for me to find the will to update daily. Twice a week will seem like a vacation after this! I might do some more random retromags topics periodically, since perusing their uploads has become quite the hobby for me. It really is a great site, and I hope they keep up the good work. If you have the resources to help or even just some dusty old magazines to donate, please give them a hand! 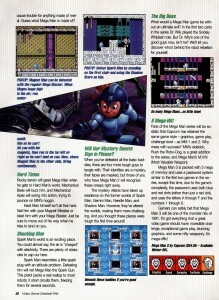 5 Comments to "Retro Jumble"
The Official Guide to megaman and Gamepro's Hot Tops: Adventure Games also reffered to Gamma as "8". 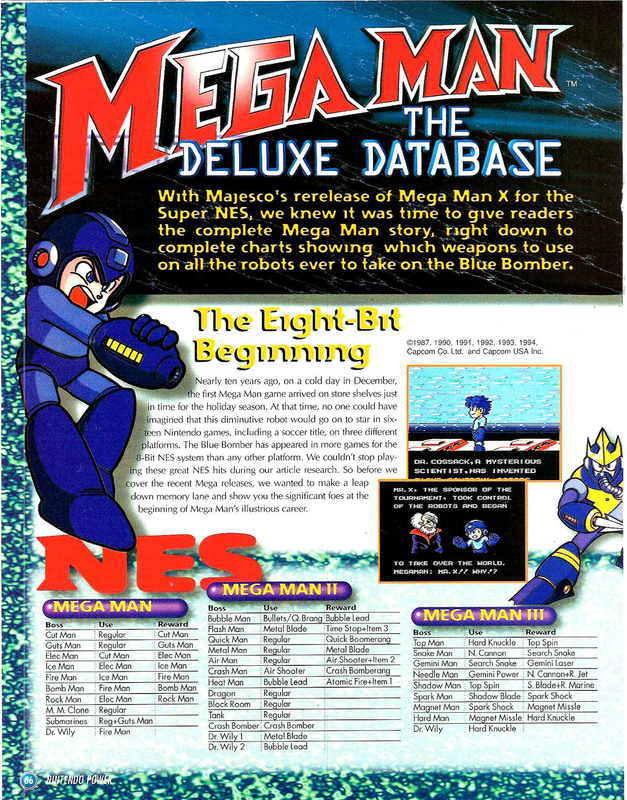 I clearly remember one source claiming that Mega Man 64 was an all-new game, but I wouldn't be able to say if it was Nintendo Power. Ugh, I want to punch out the guy that reviewed MM5GB up there. Can't go around punching out every reviewer who was less than thrilled with Mega Man, otherwise your knuckles would never stop bleeding. Good or bad, I never cared much for magazine reviews at the time, but now I treasure them. 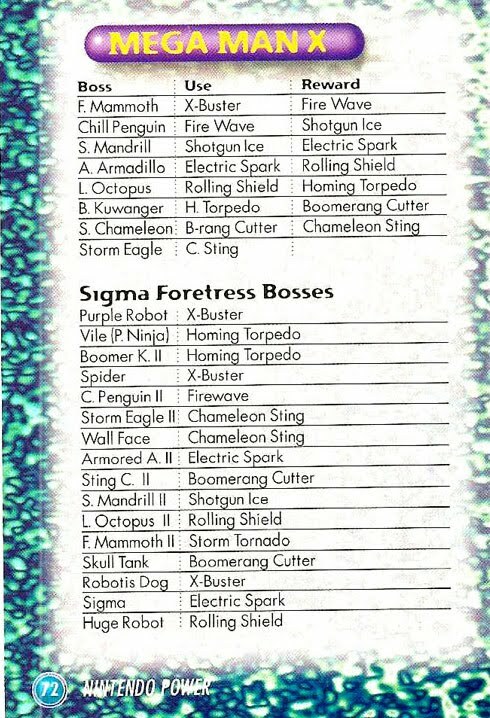 I'm not surprised about other Gamepro guides also using the same nomenclature, they seem pretty consistent to themselves. But I'm surprised to hear about the Official Guide to Mega Man using "8" for Gamma, tho. I don't remember that.